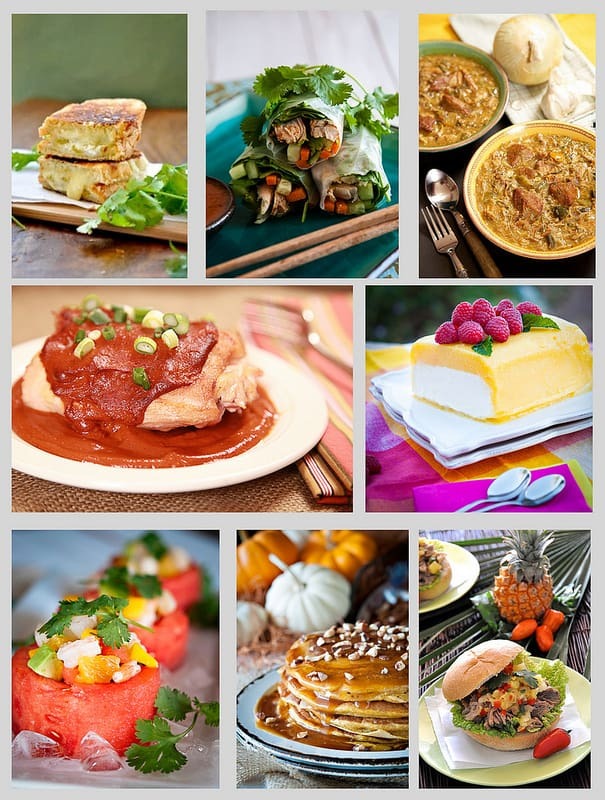 It’s time for our annual “Top Ten List” of the year’s most viewed and most requested recipes on Everyday Southwest. We’ve had some really great recipes this year and, luckily, we don’t have to choose our favorites. You did! I have searched through the Google and WordPress stats to discover your most loved recipes of the year. Before we get started with the count down, we’d like to thank all of you for your support this year; all of your comments and kind words. It has been so fun getting know some of you on Facebook and twitter. If you don’t follow us yet, please do! We love hearing from you. Please continue to let us know how you like our recipes and what you would like to see on the blog in the upcoming year. We really have fun putting together recipes to share with all of you and hope you like them as much as we do. Now… on to the countdown! 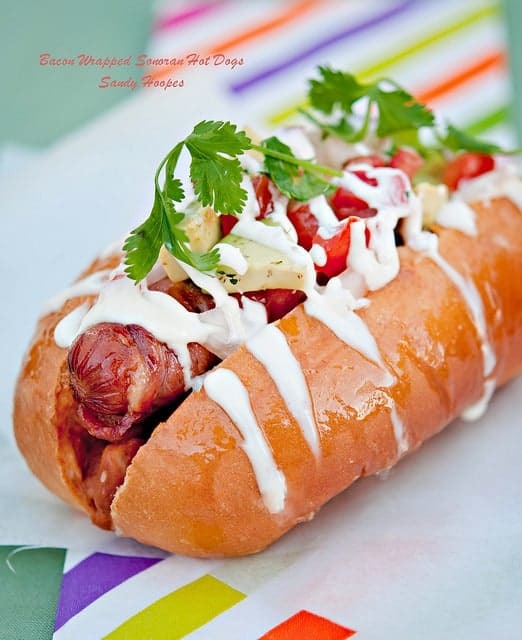 First place recipe with the most views and the most searched recipe of the year is, of course, the Bacon Wrapped Sonoran Hot Dog. Who doesn’t love bacon wrapped anything? This Tucson favorite has been a hit from the start and was even featured on the Huffington Post and the Visit Tucson website. The Sonoran Hot Dog is wrapped in bacon then grilled to crispy perfection. Place it in a warm bun (or soft bolillo if you are lucky enough to have a great Latin bakery nearby) and top it with beans, avocados, cotija cheese, salsa, crema or any of your favorite Latin flavored toppings for a hot dog to rival the world’s best dogs… look out Chicago and New York! Second place is a wonderful surprise to me. 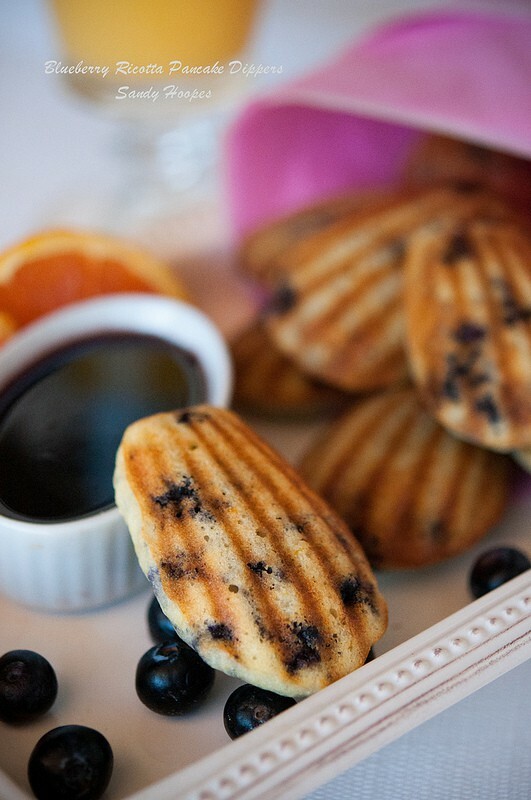 Blueberry Ricotta Pancake Dippers is a fun idea for breakfast in bed. Mother’s day was coming and I was thinking about all the times my boys made pancakes for Mother’s Day breakfast. I came up with the idea of cooking the pancakes in a Madeleine pan so that little fingers can easily eat them in bed without the need of forks or knives. It was a hit! Now that my boys are grown, they still loved them. The proof is that they sneak a pancake every time they walk by. I was lucky to get a batch big enough to serve everyone at once! I used a nice firm ricotta pancake with tiny wild blueberries but, I don’t see why you can’t use any of your favorite pancake recipes in the Madeleine pan. 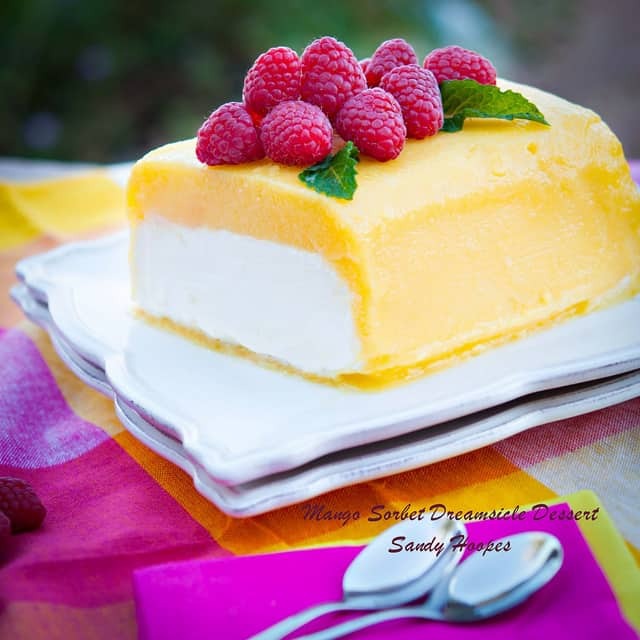 Third place recipe is this beautiful Mango Sorbet Dreamsicle Dessert. Remember the “dreamsicles” (some areas of the country called them creamsicles) from the ice cream man? I remember waiting and listening for the ice cream man and chasing him down the street for a Dreamsicle ice cream. This is a “grown up” version with tart mango sorbet surrounding vanilla ice cream. Garnish it with raspberries for a show stopping dessert or just make the mango sorbet on it’s own for a refreshing way to beat the heat. 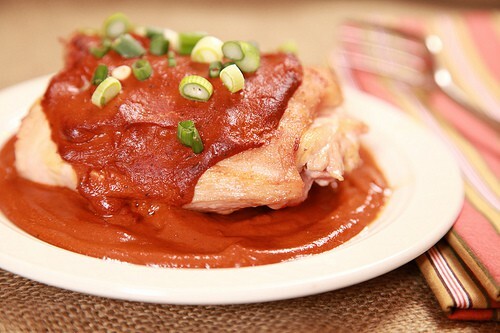 Easy Slow Cooker Chicken Mole is the fourth place recipe. Leave it to Donna to find a fast and easy way to make this Southwest classic into a weeknight meal. Usually, mole is a very involved, very time consuming and very traditional Mexican sauce. Donna has simplified it and used the slow cooker for tender, delicious chicken. 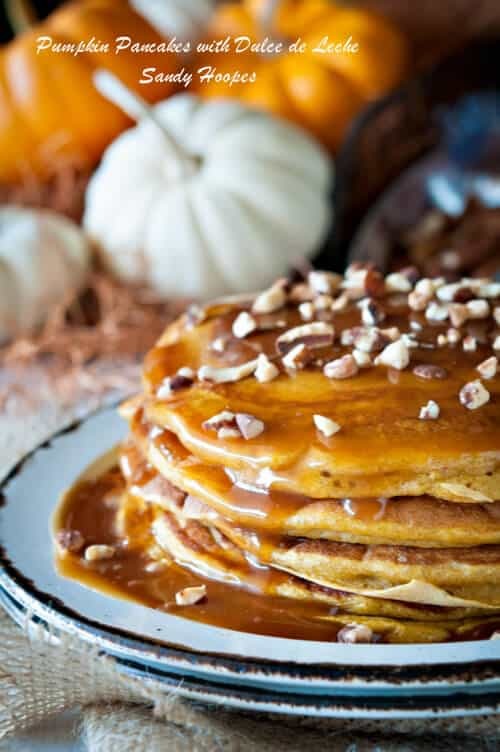 Sixth place in the countdown of the year’s best recipes is Pumpkin Pancakes with Cajeta de Leche (or dulce de leche). This really is delicious and filled with fall flavors. The dulce de leche sounds very sweet but, amazingly, it is not as sweet as syrup. Dulce de leche is a Latin caramel sauce made from condensed milk. So, it is even healthier than syrup. I added chopped, toasted almonds for a little crunch. The Cooking Channel even listed these pancakes as one of their “5 Hot Links We’re Loving” for fall (number 4 link under the ice cream cone). 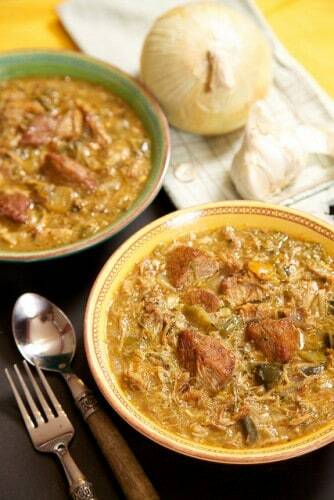 Seventh Place recipe is Donna’s Four Pepper Slow Cooker Chile Verde. It’s another fantastic family meal that is so easy that you can cook it in the slow cooker. 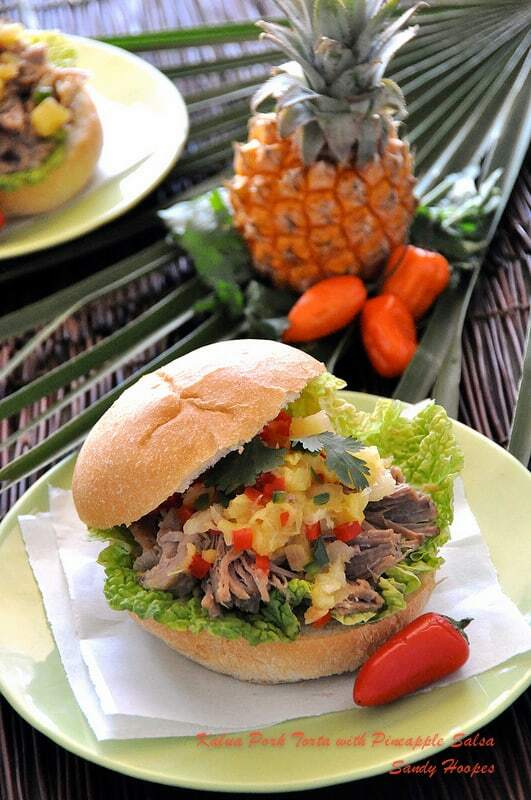 The pork is tender and flavorful with just as much heat from the chiles as you would like. Serve it with some fresh, warm flour tortillas or crusty bread. Perfect for a chilly winter’s night. 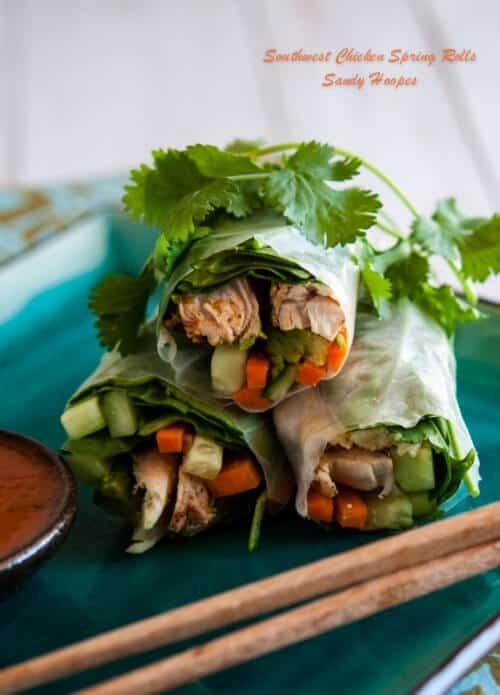 Eighth Place in our countdown is Southwest Chicken Spring Rolls Recipe. I fell in love with spring rolls while attending a photography class taught by Diane and Todd from White on Rice Couple. The class was amazing enough but, at the end of the day, Diane and Todd brought trays of fresh herbs and vegetables into their studio kitchen so we could have dinner together. Diane showed us all of her favorite herbs and how to roll the spring rolls. By the end of the meal, we felt like old friends. When I got home from the class, I had to recreate the spring rolls for my family. We had just as much fun together; laughing, talking, passing the ingredients to each other. Of course, I grilled my chicken with southwest spices and added avocado and cilantro. You can use any fresh ingredients you like, the most important part of this dish is breaking the ice and getting everyone at the table talking. 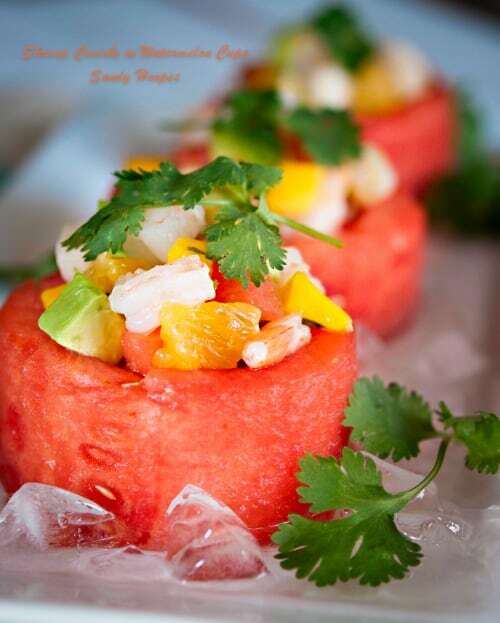 The ninth place recipe is this fun Shrimp Ceviche in Watermelon Cups. We practically live on ceviche around here in the summer. Ceviche is light and cool and NO cooking! The perfect food (in my opinion). The watermelon cups are a fun way to use the fresh juicy watermelon I had left from a watermelon carving contest. Yes. A watermelon carving contest hosted by Watermelon.org. I had never thought of carving a watermelon before, either. But it was lots of fun and I had lots of watermelon leftover! I love the ceviche recipe in the watermelon cups. The tangy lime and citrus juice gets into the watermelon and all the flavors work well together. It’s a great recipe for a hot summer’s day. Last, but certainly not least, is number ten in our countdown of recipes, Grilled Cheese del Mar or Grilled Cheese from the Sea. This recipe was sort of a “Thow Down” Bobby Flay style with my friend Heidi from Foodie Crush. Heidi had posted a great grilled cheese sandwich for National Grilled Cheese Day and I couldn’t resist jumping into the action with a Southwest style grilled cheese of my own. 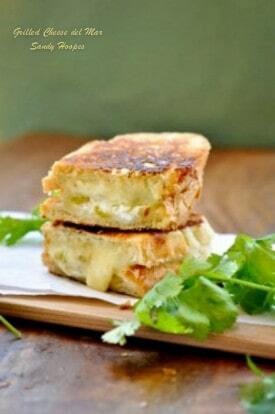 This grilled cheese has Monterrey Jack cheese, roasted green chiles and grilled shrimp. 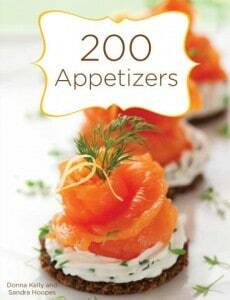 I hope one of your favorite recipes is on this year’s list. If not, leave us a comment and let us know what your favorite recipes are. Be sure to let us know if you have any ideas for recipes that you would like to see on the Everyday Southwest. Do you have a favorite Southwest dish that you would love to know how to make? Let us know. If we don’t have the recipe, we will certainly find an expert for you. Keep in touch this year, we love hearing from you! You can leave us a comment on the blog or follow us on twitter or facebook. Yes, I am finally getting the hang of Facebook! Here’s to a great New Year for you and your family and friends!